While our American neighbours have had access to Amazon’s Alexa assistant for Echo devices, Canada was left waiting for years. That all changed in November when Amazon announced Echo devices (and Prime Music) would launch in Canada in December. Amazon Canada sent us their latest second generation Echo to check out, so here are some quick thoughts with the product. The smart speaker wars have really started to heat up in Canada. Google launched their Home and Home Mini products here back in June, and six months later Amazon’s Echo, Echo Dot and Echo Plus have landed in the Great White North. Both Google and Amazon are quickly establishing a lead over Apple in the smart speaker race, as the latter’s HomePod has been delayed and there’s no word when it’ll even launch in Canada. 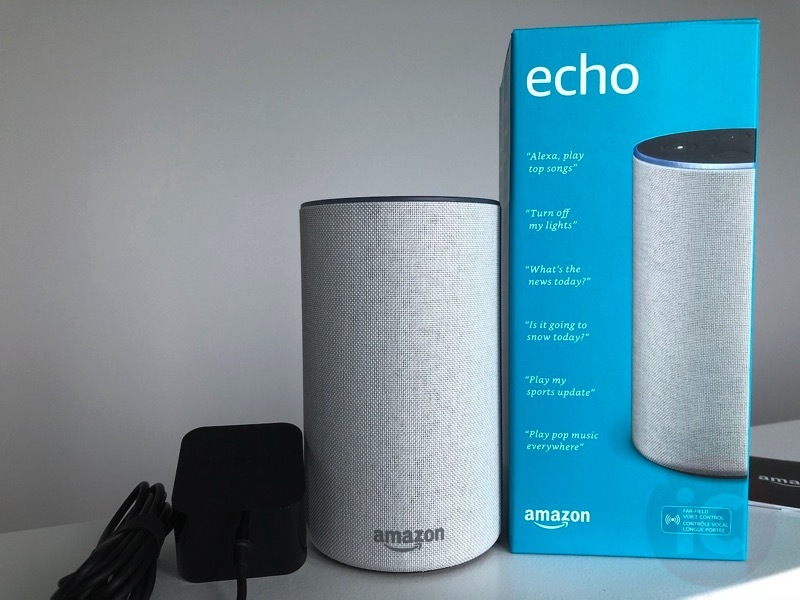 As for the Amazon’s Echo, the latest second generation currently is available at an introductory price of $99 CAD, much cheaper than the first generation’s price in the U.S. when it debuted, at $180 USD (the Echo currently costs $99 USD in the U.S.). Unboxing the Echo in Sandstone fabric revealed a 14.8cm tall cylindrical unit with an 8.8cm diameter, plus decent weight to it, at 821 grams. On top are four round buttons: volume up/down; mic mute; an Action button; and seven microphones. All of these are surrounded by a light ring which changes colour depending on current actions. The Action button will let you turn off a timer or alarm if you’re nearby, while also wake Echo. On the bottom is a rubber pad which prevents your Echo from sliding around, while next to the AC adapter plug is a covered AUX out 3.5mm port. Users can also easily remove and change the shell on Echo. With the device unplugged, hold the shell in one hand, then press the button on the bottom the unit until the shell is released. Then just push up and it easily removes. Putting a shell back is very straightforward as you just slide it back on. Setting up Echo was relatively straightforward. First, you need to download the Alexa iOS app from the App Store (not updated for iPhone X yet btw), then sign in with your Amazon.ca account. Next, you’ll turn on your Echo by plugging into—the light ring will turn from blue to orange and the speaker will ‘greet’ you. The Alexa app guides you through this process, where you’ll need to agree to terms, choose your language and connect to Wi-Fi. Canadian English is available but there’s no support for Canadian French yet, unlike Google Home. Connecting to Wi-Fi requires you to go to Settings on your iPhone, then connect to Echo in the Wi-Fi menu, then return back to the Alexa iOS app. Once that’s done, you then need to re-connect back to your home Wi-Fi network. If all goes as planned, you should see “Connected to Echo” within the Alexa iOS app. From here, the Alexa iOS app setup will be “preparing your Echo”, which takes a few minutes, and once complete, a short “Intro to Echo” video appears to help you get started with your new speaker. A test phrase asks you to speak to Echo for the first time, saying “Alexa, what’s the weather?”. Another test also gets you to try asking Alexa to play music or media, then use the “Alexa, stop” command to pause, along with another example phrase “Alexa, what’s the news today.” In the Alexa iOS app settings, there are options to change the wake word to “Amazon”, “Echo” or “Computer” instead of “Alexa”. As for the speaker itself, there’s a “downward-firing” 63.5 mm subwoofer inside, along with an “upward-firing” 16 mm tweeter, offering Dolby sound. Music services supported include Prime Music, which is included free with Prime subscriptions, along with Spotify, TuneIn Radio and Radioplayer Canada. Apple Music support? Forget about it, not going to happen. How did music sound? Well, lately I’ve been spoiled by the Sonos One, so the Amazon Echo isn’t close to that level yet (Sonos One costs $249 CAD vs Echo at $99). But for its size, the Echo is alright to fill up a room such as a home office. Bass levels won’t knock your socks off, but it is mildly present (we say this lightly) and offers some decent mids. Again, this will do the job for sound that is much better compared to a smaller speaker such as the Google Home Mini, for example. But Echo isn’t just about music, it’s about having Alexa available 24/7, to also control your smart devices at home, such as products from Philips Hue, ecobee, Schlage, TP Link, Nest and more. Echo doesn’t support Apple’s HomeKit, so if you’re already invested into the latter’s ecosystem, you probably want to wait for HomePod to eventually show up in Canada (possibly in 2018). All of our smart devices at home are HomeKit compatible, so we weren’t able to test out Alexa’s smart home voice controls. If you want a built-in smart hub for easy setup of smart devices, you’ll want to opt for the Echo Plus at $169.99. When it comes to controlling Alexa, the far-field voice recognition with seven microphones works very well, even when loud music is playing and you’re across the room, thanks to beamforming technology and enhanced noise cancellation. Just say “Alexa” and music will lower in volume as you detail your command. Alexa has “thousands” of skills, which lets you ask it various questions with numerous companies on board, offering a broad range of answers. You can enable or disable skills in the Alexa iOS app, and there are tonnes available. This is one area where Amazon and Google will have a huge lead over Apple, by the time HomePod rolls around. While Alexa skills are great for getting news, sports and weather briefings, some queries didn’t provide any results. When I asked “Give me a recipe for chocolate chip cookies,” Alexa said “I’m not quite sure how to help you with that”. But when I asked my Google Home Mini, it was able to suggest a recipe and asked if I wanted to proceed, then let me have step by step instructions, at my pace. Just an observation worth noting for you cookie lovers in the kitchen. Echo offers free audio calls to Canada, the US and Mexico. 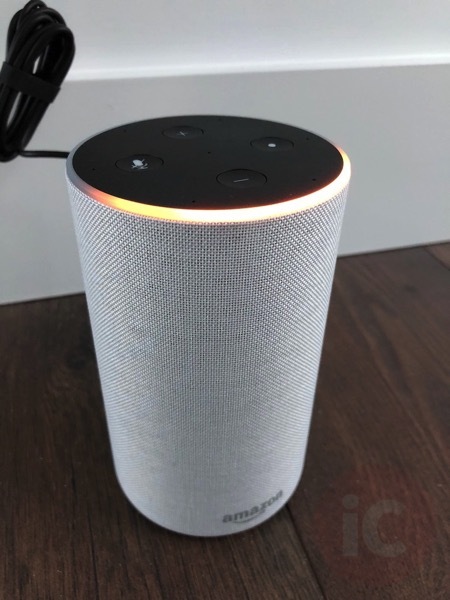 It can also send voice messages for your contacts who also have an Echo, with messages being delivered within the Alexa iOS app under the messaging tab. 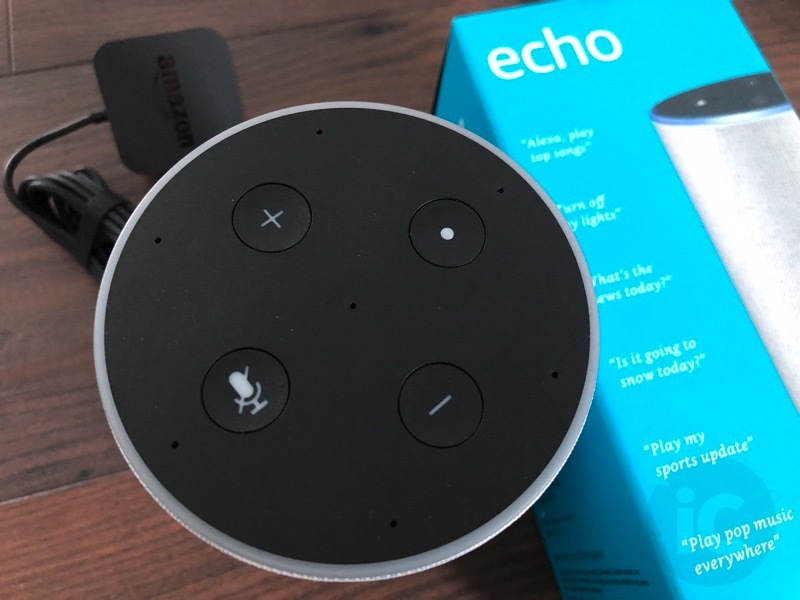 There is also a featured called Drop In, which lets you connect to an Echo device with two-way audio, which can come in handy if you want to use your devices in the house like an intercom. This feature can also be granted to other Echo friends and family members as well. Drop In doesn’t require your speaker to answer—just tap ‘Drop In’ and the speaker you’re ‘dropping in to’ will make a chime and the light ring will turn green. The Alexa iOS app also provides you with feedback cards, allowing you to replay your voice commands and rate them. It’s kind of creepy hearing yourself giving these commands again, but it does show Amazon is quickly gaining feedback from users to improve Alexa. 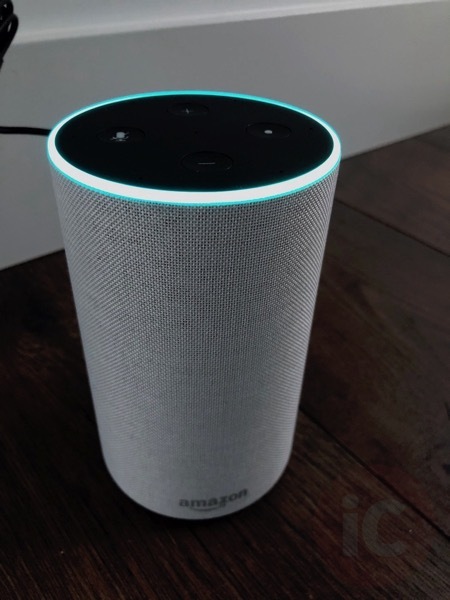 Echo can also let you make purchases on Amazon.ca with your voice, with an option to enable a ‘Purchase voice code’ option, to prevent accidental purchases. I was able to buy toilet paper for fun (I cancelled it afterwards) with my voice and it was glorious. The future is here, folks. It took some time, but Amazon’s Alexa finally has landed in Canada, and there are a trio of Echo devices readily available for purchase, currently at ‘introductory pricing’ to get customers into the ecosystem. As for the Echo itself, it does the job for filling a room with sound for music, but won’t blow you away like a Sonos One (which will get Alexa support in early 2018). The Echo’s seven mics never fail to hear your voice and Alexa, with its growing number of skills, will get you the information you want whether it’s from the web or companies building skills. If you have compatible smart home lights, thermostats and more, Alexa can also control them too. As for a negative, Echo only currently supports Canadian English, with no support for French available yet. 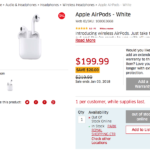 But for its price of $99 CAD, the speaker currently rivals Google’s Home, which is also priced the same as part of Boxing Day sales, but supports Canadian French. 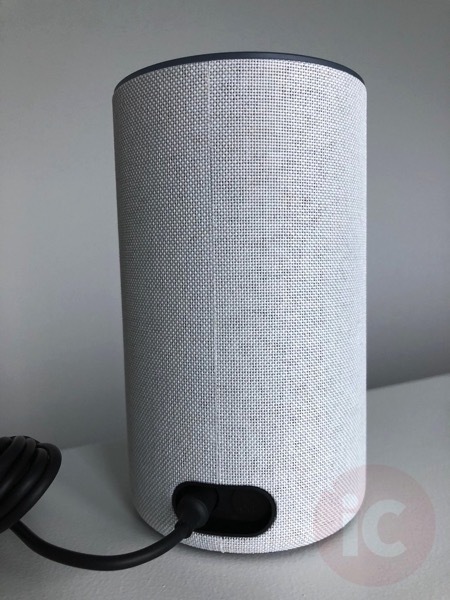 Echo does the job as advertised and comes in three attractive colours, while the price of $99 CAD is at the impulsive price point for those looking to get into a smart speaker. Amazon will continue to develop Echo’s smarts and finally Canada gets to join the smart speaker war, while we wait for Apple’s HomePod to land sometime, hopefully next year. Do we need smart speakers? Of course we do. We’re getting lazier as a species and there’s no stopping the convenience of ordering new underwear with your voice, while you’re lounging in underwear. Click here to learn more about Echo on Amazon.ca while the limited time pricing of $99 is still available. Are you using an Echo device? How do you like it so far?